BUCHANAN, Jr. James (1791-1868) was an American politician who served as the 15th President of the United States (1857–1861), serving immediately prior to the American Civil War. A member of the Democratic Party, he was the 17th United States Secretary of State and had served in the Senate and House of Representatives before becoming president. 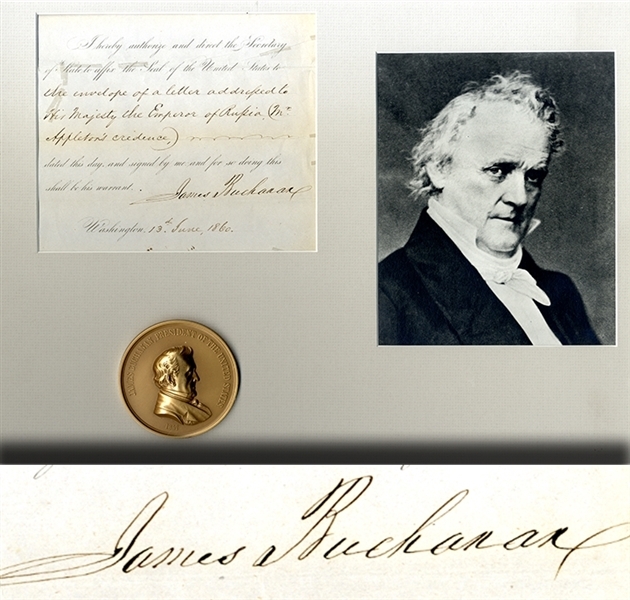 Document Signed “James Buchanan” as President of the United States of America, Washington, D.C. June 13, 1860, authorizing the Secretary of State to affix the Seal of the United States on official correspondance to the Emperor of Russia. With Buchanan medallion and image of the president. Fine condition.